Polymyositis, light micrograph of a section of affected muscle. Polymyositis is a disease caused by inflammation of the muscles. This occurs when white blood cells, the immune cells of inflammation, begin to invade the muscle tissue. The muscles most severely affected are typically those closest to the trunk or torso. This results in weakness that can be severe. The exact cause of the disease is unknown but it shares many characteristics of auto immune diseases so corticosteroids are the first choice of treatment. 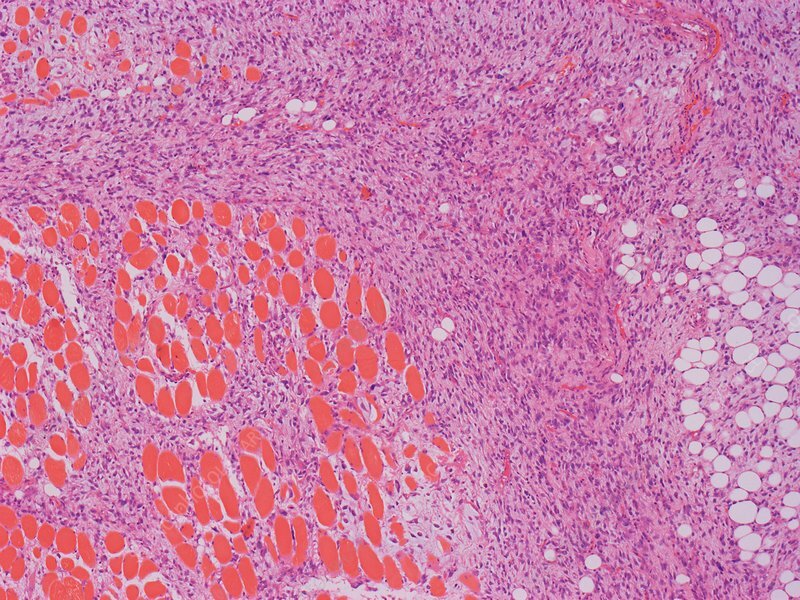 Histopathology of polymyositis shows mononuclear inflammatory infiltrate and muscle fiber necrosis (left of image). Magnification: x 100 when printed at 10 centimetres wide. Human tissue.